The Proposal Submission System/Abstract Management Module can assist you if you are conducting a 'call for proposals, a 'call for presenters' or a 'call for articles' in preparation for a conference, convention, or publication, which will allow your presenters to submit their proposals online. After which, you can organize committees to screen and rate the proposals to make a selection. With the help of the diagram to the right, you can follow the progress of a proposal submission through its 'life-cycle'. Initial Submission - It starts with the initial submission by a would-be presenter. The presenters can be from your membership or the general public. The submitter goes to your organization's request-for-proposal menu page. The link to this page can be placed on your website or included in an email to your members. From this page they can select which call they are responding to (the system allows for multiple requests-for-proposals). The submitter then goes through a series of pages where they enter their contact information, co-presenters, select a topic/subject; select a type of proposal; then enter their title, abstract, and proposal text. Subject/Topic Chair - After submission, an email notification is sent to the subject chair. At this time, it is up to the chairmen to log-in to the members area and 'screen' the proposal. That is, to read it over briefly and decide whether to accept it, accept it with reservations, or to reject it outright. If accepted, the chair must assign it to a committee member or members for scoring. When a request-for-proposal is set-up, each topic/subject that is entered for the request can have as many chairmen and committee members as admin deems necessary to spread the workload. 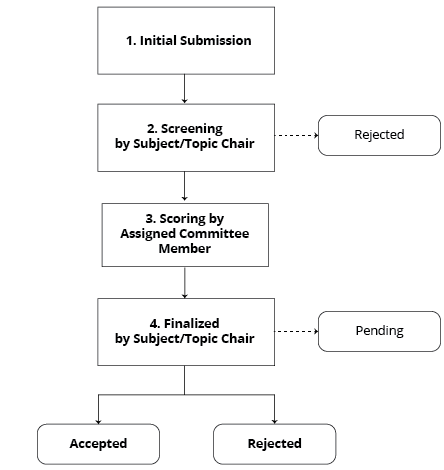 Subject/Topic Committee Member(s) - After passing the screening process, notifications are sent to the committee members assigned to the proposal. The committee member must then log-in to the members area and 'score' the proposal. The committee members read through the proposal and assign scores based on criteria that are decided on when setting up the request-for-proposal. Once all assigned committee members have scored the proposal, an average score is assigned to the proposal, the scoring process is complete and the proposal goes on to the next step. Administrator - After scoring is complete the assigned administrator receives a notification. The administrator can then 'finalize' or review the proposals that have been scored and accept, reject, or pend them as necessary. This is done until all proposals have been submitted, screened, scored, and finalized. There are plenty of configuration options in the Proposal System that will allow you to close topics for committee signup, once enough committee members have been assigned to one of the topics of their choice. Committee and scoring assignments can be done manually by admin or chair, or automatically by the system, based on criteria that you set up in advance. Other options will allow the elimination of the chairman position and allow admin to fill this role if the call for proposals expected response is smaller and does not require so much manpower for screening and committee assignments. NOTE: Your price tier will be determined by your organization's membership size OR by your typical event's attendance size, whichever is greater.